Sci-fi themed mobile stage built on modified 50-foot bus chassis outfitted with KLA12 active line arrays, E218sw subs and TouchMix-30 Pro digital compact mixer. The Ark of Orenda is an art and music vehicle operated by the non-profit, High Seas Energy in affiliation with Burners without Borders. 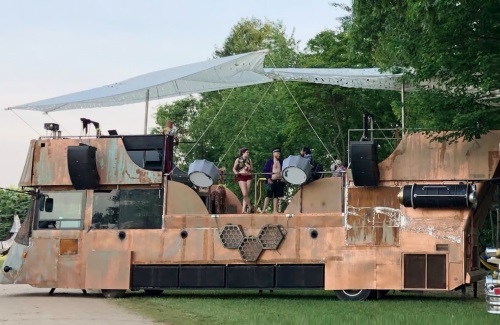 Visually inspired by “the kind of desert hovercraft barge a sci-fi villain rides around on” according to Artist Jeff Deehan, it has already toured regional Burner gatherings and will make its official debut in the Black Rock Desert of Nevada this coming summer. Deehan and audio engineer John Buehler designed an audio system using QSC live sound equipment exclusively, with KLA12 active line arrays for the main front of house; four E218sw dual-18-inch passive subwoofers driven by PLD4.5 power amplifiers to provide extended bass; K12.2 active loudspeakers serve as stage monitors; together with a TouchMix-30 Pro digital compact mixer. “The key word for us was value,” says Deehan of the choice to go all-QSC. “The Ark is built on a highly modified 50-foot bus chassis and opens up into a stage. We had operated a smaller art car in the past with QSC gear and were very happy, so for this larger one, it was a ‘Goldilocks’ sort of fit. The QSC gear is well-priced and sounds great. A central feature of the TouchMix makes Buehler’s life easier, as he describes: “I really like the big rotary encoder. The environments we are working in are dusty, dirty, and sometimes wet. If I pull a fade on a touchscreen — and this is no fault of the touchscreen itself — it might go all erratic because my hands are sweaty and filthy. Assigning a fader to the rotary encoder is just a tap, which works fine, then I have a nice, big, physical knob to do a smooth fade or precisely cut a dB from something.